8.5" x 7.25" x 5.5"
(Pablo Ruiz y Picasso), 1881-1973, French painter, sculptor, graphic artist, and ceramicist who worked in France; the foremost figure in 20th-centuray art. Leader of the School of Paris, he was known for his technical virtuosity, originality, and prolificacy. 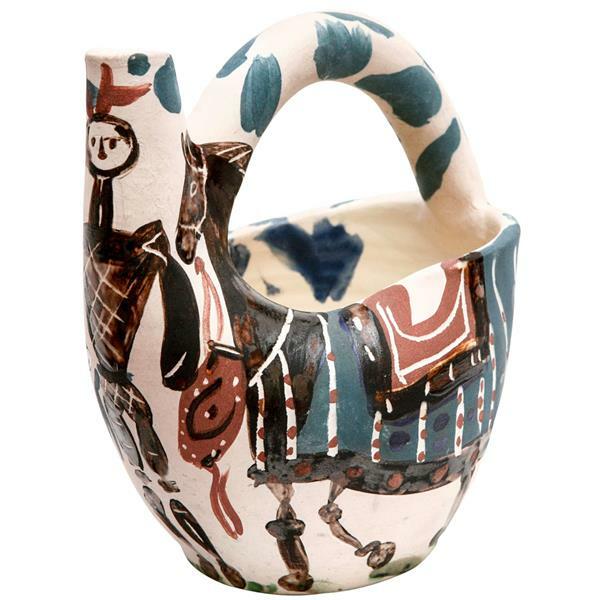 During the World War II years, Picasso did a lot of modeling in clay and creating of assemblages with found objects, and many of the pieces, especially after the War, expressed his sense of humor. Also after the War, he began creating with ceramics, and he was very productive with printmaking. In his later years, Picasso turned to creations of fantasy and comic invention. Working consistently in sculpture, ceramics, and the graphic arts, he continued to explore his personal vision until his death at 91.